A vacation trip to the ocean or a lake was a popular destination around the turn of the last century. (Not surprisingly, it still is). Manufacturers developed a number of different spoons to sell to tourists at these popular resort destinations, and it is not surprising that we have a lot of different designs in spoons. 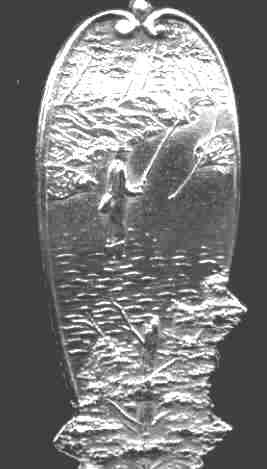 Spoons depicting fishes, fishing and fish related activities are fairly common. The examples here are NOT meant to be exhaustive. The Columbian River Salmon spoon is also fairly popular. This is a demi version. An enameled trout is featured on this spoon from "Muscova"
I don't know what type of fish this is. The bowl is marked "Cottage City" and shows a sailboat. The spoon is a hand assembled piece. Ocean City, New Jersey spoon which has an applied fish on a wire and at the finial there is an applied turtle. This spoon style could have been engraved at many ocean front tourist cities. 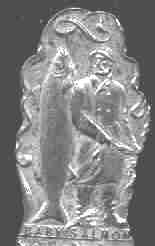 This is a very large cast Dutch spoon featuring a fisherman holding a fish and a fish net. The quarter is to show relative size. The marks indicate it is 800 silver and was probably from the 1890 -1925 time period. 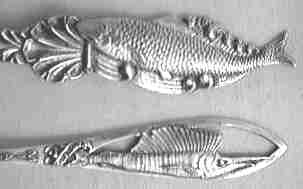 In the 19th century there were also some very interesting fish servers (slices), and fish forks which are not considered to be souvenir spoons although they do have their own beauty.